United Nations has proclaimed 2019 as the International Year of the Periodic Table as per A/RES/72/228 and 39C/ decision 60. IARC | Centre for United Nations is at the forefront of driving United Nations initiatives in India. Since 2011, the coveted ICUN programs are conducted at India’s best schools, colleges and universities including IITs and IIMs. 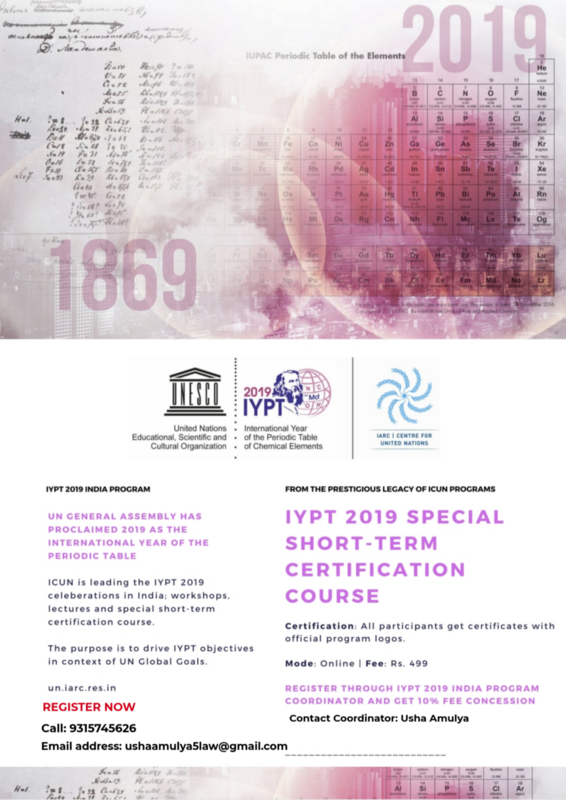 IYPT 2019 India Program is based on UNESCO-led IYPT 2019, which recognizes the Periodic Table as the very basis of physics, chemistry, biology, business and all of engineering; it is essentially a window on the universe, helping to expand our understanding of the world around us. Grading: Grades A+, A, B & C will be awarded. On successful completion of the assessment, a certificate will be awarded. Register for the program directly or through the coordinator. Click here for the payment link. Participants who opt to register for the program through the coordinator are eligible to receive a fee concession of 10%.